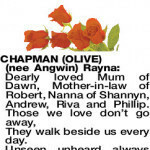 (nee Angwin) RAYNA Dearly Loved Mum to Iris and Phil. 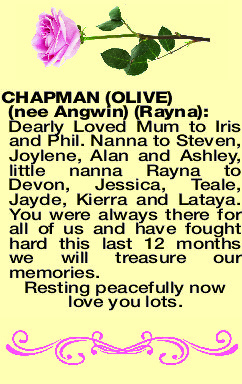 Nanna to Steven, Joylene, Alan and Ashley, little nanna Rayna to Devon, Jessica, Teale, Jayde, Kierra and Lataya. You were always there for all of us and have fought hard this last 12 months we will treasure our memories. Resting peacefully now love you lots. 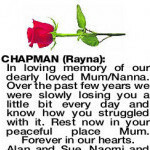 Relatives and Friends of the late Rayna Eunice (Olive) Chapman of Geraldton are respectfully informed that a Service to pay tribute to Rayna's life will take place at the GERALDTON Crematorium, on FRIDAY (5.04.2019) at 12 Noon. 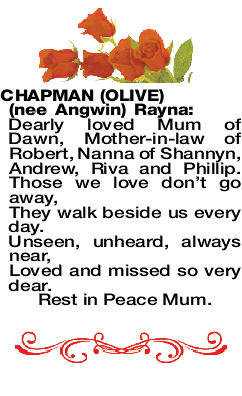 In loving memory of our dearly loved Mum/Nanna. Over the past few years we were slowly losing you a little bit every day and know how you struggled with it. Rest now in your peaceful place Mum. Forever in our hearts. Alan and Sue, Naomi and family, Brodene and family, Katrina and family. 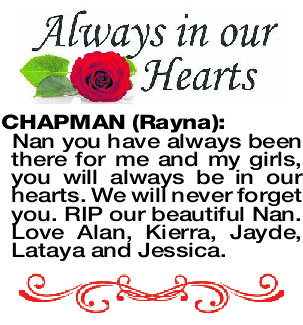 CHAPMAN RAYNA Nan you have always been there for me and my girls, you will always be in our hearts. We will never forget you. 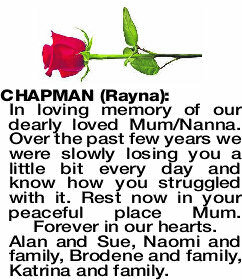 RIP our beautiful Nan. 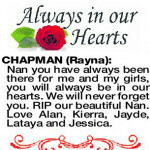 Love Alan, Kierra, Jayde, Lataya and Jessica. 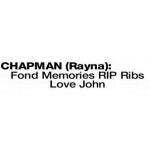 CHAPMAN RAYNA Loving thoughts are with the families. 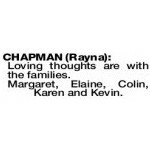 Margaret, Elaine, Colin, Karen and Kevin.